For my whole life, I’ve had a slightly obsessive personality. Like, when I like something, I REALLY like it. And then I like it or do it or eat it until I’m completely sick of it, and then I move on. Ask my mom about my white Champion sweatshirt phase in middle school. I had one for every day of the week. Apparently I live in phases. But that’s also why I like project work like quilting. I always have. I think I find the need to work something out, whether it’s an idea or a song or a color, to figure out why it sticks with me. To analyze it and my reaction to it to try to glean something about myself. To gain a new perspective or a bit of insight. I’ve been trying lately to listen more to my gut and to trust it. And all of this obsession sometimes helps with that. My obsession with the mid-century trellis shape started last May, when I was watching 24: Live Another Day with my husband (we were very much into Season 4 — peak obsession — but my viewing was a nostalgic one). There was this shape that I saw in the conference room scenes that I just loved to look at. It’s pretty hard to miss in this promotional photo (I wasn’t sure if I had permission to download and post it). I couldn’t get it out of my head. I found myself ignoring the action in the show and staring at the sets. (Can you see how it’s in every bannister in the office? It was in every single shot of that office.) I knew I needed to make it a quilt. My gut was begging me. Finally, near the end of the season, I paused the screen to sketch it out on graph paper, then edited it a bit for logistics, to make it pleasing to my gut, and to make it less of a direct copy of another designer’s shape. Thus began Peek Obsession, which is still in full force. Certain serendipitous factors in the design made this a joy to put together, and I made a few prototype blocks to find ways to make it faster and more enjoyable, which not only inspired the quilt Peek, but also planted the seed for a block that I’m going to teach and write a pattern for. Sometimes making a quilt cures me of an obsession. I certainly got my fill of paper-pieced letters after Love Letters, and it took me three quilts, but I moved on from skyline quilts after the Poppstrong quilt. But Peek just made me want to make the block in different flavors, and so I did. But I still don’t feel like I’m done. I can’t wait to see what my students do with it in our class this coming Monday at Rock Paper Scissors (we had to reschedule because of the snow– there are two spots open if you’re available and near Montclair, NJ around 7PM). I love that the block, with its skinny piecing, forces you to pay close attention to your 1/4″ seam allowance, but that there are no seams that need to match up. You can be simple with solids or scrappy with a fussy-cut center. I’ll also be teaching the block at the Mid Atlantic Mod retreat at the end of April. 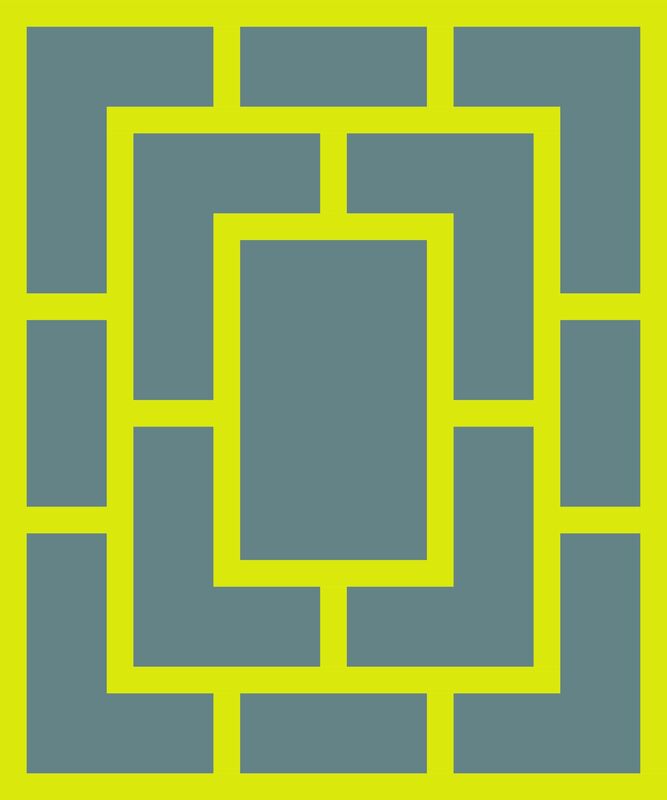 This week I finally solidified a plan for a quilt made entirely of Peek blocks. 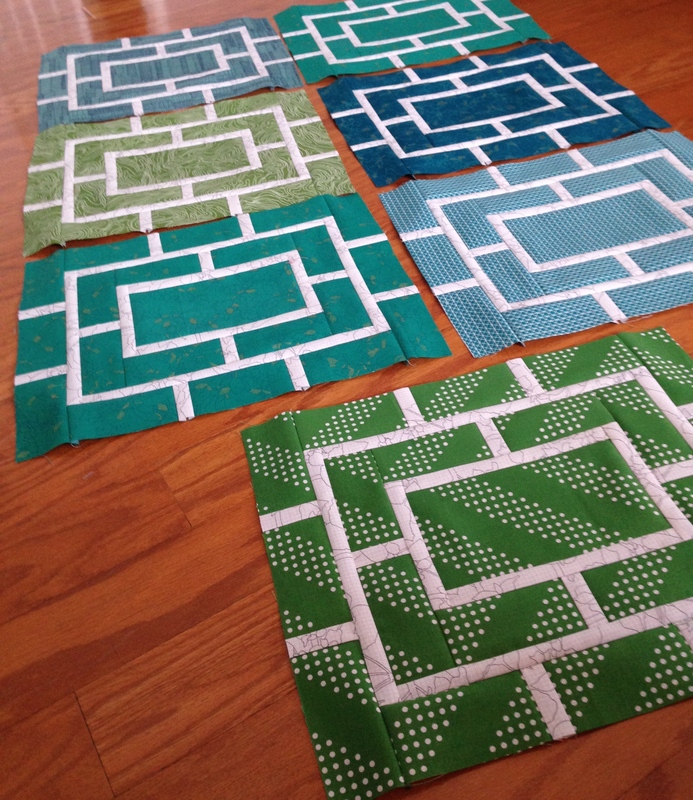 It’s going to use greens, blues, and teals with a white Botanics print for the skinny pieces. I’ve got seven blocks so far. One day I will be done with Peek blocks, but this obsession has been in full effect for almost nine months, and I’m looking to continue it for as long as it has something to teach me. Then again, maybe it’s not an obsession. Maybe it’s true inspiration. I hope you’ll humor me and join in on the fun. 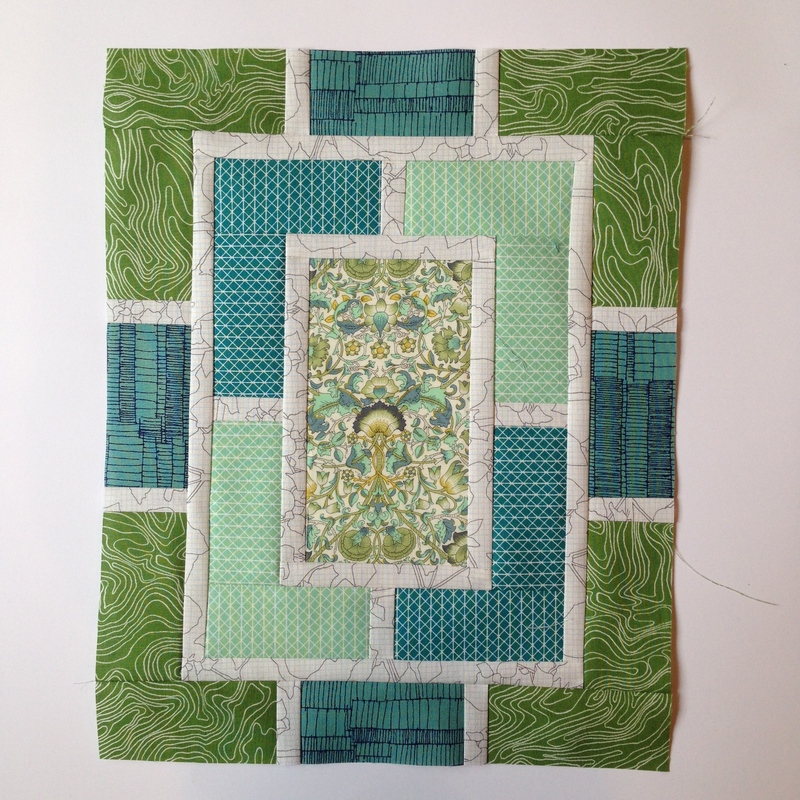 Do you have a quilting obsession? Do you live in phases? I’ve been obsessively making medallion quilts for a couple of years. I love them because every one is different, a new challenge. Even using a fairly small number of familiar blocks, there is infinite variety in how the quilts turn out. I do believe that at this point, I know more about making medallions than anyone else out there, at least in the blogosphere. Your trellis/lattice is a wonderful obsession. 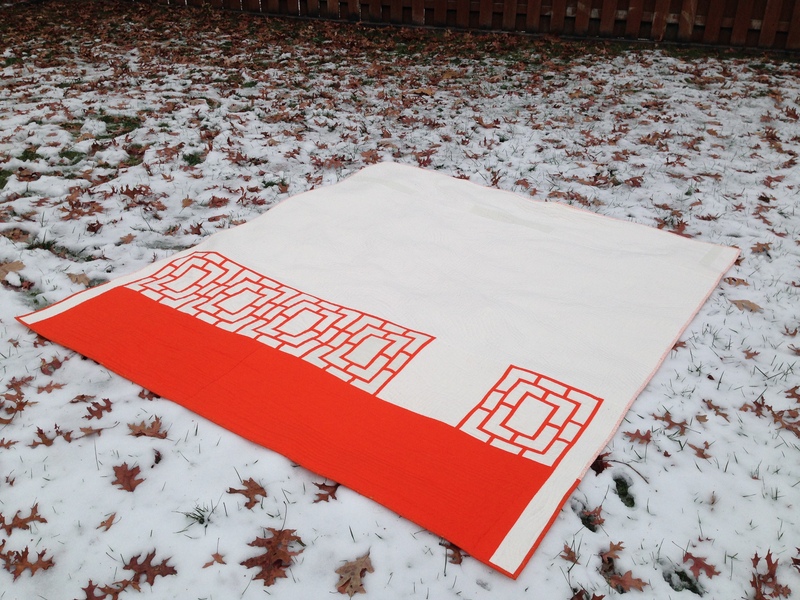 I made a small Garden Maze quilt (finished binding last night) with the same fascination about the screens. The small quilt was an experiment (and I learned a lot!) I intend to make a bed quilt of same format another time. I had been dying to know your inspiration for this block! Thank you for sharing. It’s such a great lesson in paying attention to the designs that are everywhere around us! Thanks for sharing your inspiration. I’ve never considered myself to be obsessive, but lately I have been on a zippered pouch kick. For me, it’s the humble hexie. I keep revisiting it again and again. I have a thing about the density of the piecing, I love the close mosaic effect of 1″ hexies. Your trellis pattern is beautiful, and I’m not surprised it’s still keeping you fully engaged. Not sure if I have an obsession but I love following yours with Peek! And being the blue girl that I am, your latest creative endeavor I am in love with. Not sure if you were so intentional about the green Cotton + Steel piece placement, but I absolutely love that block and the final feel of it. I love the different feel of the blocks depending on how the focus fabric is used. Looks like a fun block to teach! This block is ground-breaking, no wonder it is obsessing you. I love that it came from that show! I guess you never know where inspiration will come from. Goes to show how open you are to it!